Zotac is working on a GeForce GTX 460 with two GF104 GPUs. 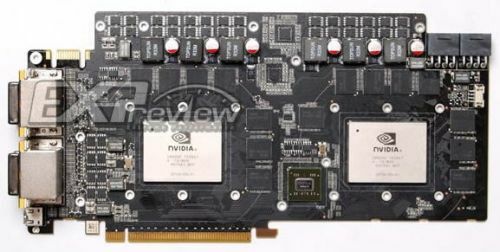 This card might be codenamed GeForce GTX 495 (like the GeForce GTX 295) or GeForce GTX 460 X2. This hypothetical GTX 495 will come with two 8-pin power connectors (keep in mind that a 8-pin connector is able to supply up to 150 watts), 672 shader cores (2×336 cores), and four DVI connectors. The ancient chinese art — Photoshop mad skillz. This seems too good to be photoshoped. Everything seems to be where it’s supposed to be. I just hope they equip it with a bulky blower type HSF, which will exhaust the hot air out of the case. Otherwise, people that want to go quad SLI, will have second and third thoughts. Noone wants 600W worth of hot air in their case. Yes you are very correct, but my hope was more general really. I was hopping for some other model, without weird looking quad DVI. One DVI, one HDMI and one DP on the lower half of the bracked would be fine. ZOTAC this Chinese manufacturer is an excrement, in Brazil the staff rejects this mark here ZOTAC like a crap!! not accepted nor of favour !!!! Anyone knows if you can use a single nvidia gpu if you have a quad sli setup? For example in a system with two of these babies, would it be possible to disable SLI and also on of the gpus of the primary card, so you can only use one of them? i love the fact that all of you go on oh there is no HDMI and no DP its really funny because there is no difference right now and between HDMI and DVI on Computer there is no difference at all even in the future because, and if you use LCD speakers well good for you, you get your sound via HDMI and you can hear HD clock Radio cool. lol. with the testing i done HDMI does not work right for computer signal (over scan or underscan) especialy on KVM ect, HDMI only use for TV has no real value for Computer LCD. so i could not be bothered if people are so worried you can get an adapter to add those extra inches so you can use your DP or HDMI just to be cool. DP ( Display Port) does have more bandwidth as for now we don’t use it and most monitors i have seen don’t even support it as yet. now for hardware people, pcb sandwitch is the best way for cooling dual GPU’s FFFF the cost i gladly paid extra to make sure it was the dual pcb. with GPU’s working like Heaters ect. we need to get new PSU Rail the DC Current is getting out of hand we need a 24Volt Rail thus reduce the amount of current plus the DC-DC convertors on the GPU and CPU will be more power Efficient as well. High Current DC means Loss simple as that, the logical option is to have new PSU with 24v 12v 5v 3.3v alot of psu’s can support easy.